Today’s dental bridges and dentures are more lifelike and advanced than they’ve ever been thanks to a number of different factors. For instance, the materials often used to create them (such as customized porcelain) is almost indistinguishable from healthy tooth structure. Also, the technology used to design them allows for extremely precise measurements and results. However, even advanced dental prostheses can wear down over time, and you may have to have your bridge or denture refitted or replaced. At our Encinitas/San Diego periodontist’s office, we often suggest that patients consider upgrading their bridges and dentures with an appropriate number of dental implant posts. Dental implants make your prosthesis even more lifelike by giving it the support of root-like anchors. Prosthetic dental bridges and dentures are meant to replace some of the most used parts of your entire body – your teeth. As such, they’re expected to experience some level of wear over time. If you’ve worn one for long enough, then you may also know that a bridge or denture can lose the firm, comfortable, and sturdy grip that it was originally designed for. This is due, in part, to the wearing down of your prosthesis; however, it’s also due to the fact that your jawbone has changed shape since you’ve lost teeth. Particularly, the roots of your teeth, which helped sustain your jawbone every time you would bite and chew while they were still present. Dental implants don’t completely reinvent traditional bridges and dentures, but they do provide them with something that all other conventional prostheses lack – an adequate option for replacing your lost teeth roots. Dental implant posts are small, root-like posts that are made from biocompatible titanium, a substance that your jawbone accepts as genuine tissue and fuses to as it heals. Each post is strategically inserted to efficiently absorb a maximum amount of bite pressure, so every time you bite and chew, it will stimulate your jaw with nearly equal intensity as that of your healthy, natural teeth roots. Once your jawbone heals to your dental implant posts, which can often take between four and six months, they can be utilized to support your new, custom-designed bridge or denture. 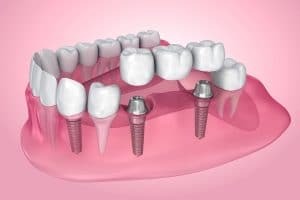 Each implant post will be fitted with an abutment that extends above the gums, connecting the implant to the appropriate area of your prosthesis. Once in place, your implant-supported bridge or denture will more closely resemble the structures of your healthy, natural teeth. This offers more comprehensive benefits such as enhanced comfort and stability, reduced wear overall, and the preservation of your jawbone structure long after receiving your implants. If it’s time to change your dental bridge or denture due to wear and tear, then consider upgrading your prosthesis with an appropriate number of dental implants. For more information, schedule a consultation with Dr. Kania by calling her periodontal office in Encinitas/San Diego, CA, at (760) 642-0711.